After doing many dive trips on boats, here’s my tried and tested liveaboard packing list. This should help you remember everything you need for a great diving vacation. Where I’ve mentioned specific products, I’ve linked to Amazon for reference. (Please note these are Amazon affiliate links). Check if you need a visa for where you’re going – is it visa on arrival or do you need to apply before you arrive. Scuba diving can take you to some pretty obscure places. Sometimes it can be complicated getting to where you need to go. Planning in advance is always wise to make it as hassle free as possible. Check international flight prices and availability. You can compare costs and timings of flights to the country where you’re diving on Skyscanner, and if you need to stop over at the airport or in town, Booking.com can help with hotels. If you’re taking domestic flights in the country to get to your dive destination, talk direct to the liveaboard head office about the best way to organise these flights and take their advice. Often, it’s best to let them book them on your behalf. They may charge a nominal admin fee for doing so, but they will be experienced in knowing the quickest routes to the dive destination and also the quirks of particular domestic airlines. Be wary of travel agents in your home country who are not familiar with your destination or experienced at booking flights and accommodation for divers – you may end up being stuck for extra days at the beginning or end of your trip due to poor flight planning by the agent. Check hotel availability. 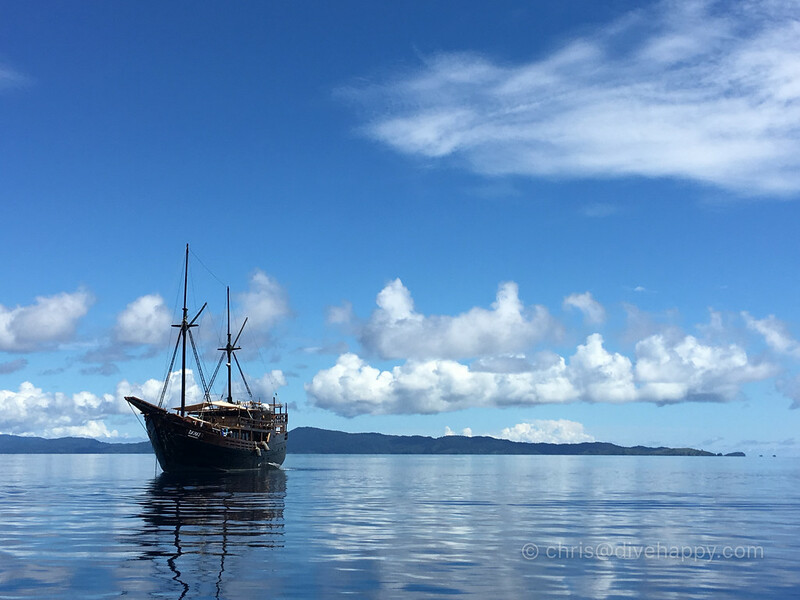 If you’re staying over before or after your liveaboard, check with your liveaboard’s office for recommendations of where to stay, particularly in smaller towns like Sorong in Indonesia (the jumping off point for most Raja Ampat liveaboards). Booking.com has a wide selection of Asian accommodation if you want to book your own places to stay online. Local currency cash is useful for transit stops in airports to get coffee, snacks etc. Credit cards are often accepted at Starbucks and so on but there’s a minimum purchase cost. Try and get some local currency from an ATM as soon as you arrive. Having cash is particularly important for tipping at the end of the trip, which should be between 5 to 10 per cent of the trip cost, if you feel it’s deserved. If in doubt, email the liveaboard head office directly and ask. Check what credit cards are accepted on the boat and what fees are charged (3% surcharge is common) – Visa and MasterCard are pretty much universal, American Express much less widely accepted. Be sure to tell your bank which country you’re visiting and on what dates to avoid getting your card blocked. If possible, take more than one card as backup. It is absolutely vital that you have travel and diving insurance organised before you go on your trip. DAN (Divers Alert Network) is the most popular dedicated dive insurance company, which is particularly recommended when in remote locations. World Nomads provides excellent general travel insurance which includes diving insurance, although you should get both policies to ensure you’re fully covered above and below water. With both companies, you can buy your policies within a few minutes online. Strepsils or similar medicated lozenges for a sore throat. Any kind of hard boiled sweet is also good to keep the throat lubricated – menthol lozenges etc are good for helping you breath easy. Sun screen and a hat, as you’ll probably be spending time on a tender boat to get you to specific dive sites. Try to buy reef safe sun screen which is certified as non harmful to the ocean. You should also bring after-sun in case you get burnt despite precautions. Mosquito repellent – mosquitos shouldn’t really be a problem on the boat itself but important if you go ashore. First Aid kit with plasters, antiseptic etc in case of minor cuts and bumps. Keeping all your items in a well-organised toiletry bag saves you hunting for each one when you need it. A hanging toiletry bag is ideal for keeping everything together on a boat and easily stowed if needed. Check all your gear at least 2 weeks before departure so you’ve got plenty of time to repair or replace anything that’s been mysteriously broken since your last trip. Most liveaboards have gear for hire, to lesser or greater degrees. If you want to reduce the amount of gear you carry with you, email the boat well ahead of time with your sizes to confirm you’ll have a specific piece of gear waiting for you. Decent dive gear bag. You need something that will protect your gear from the tender mercies of airport luggage handlers. I have had awful luck with bags, going through about 1 a year for 3 years until I got the ScubaPro Dive N’ Roll. The rigid base makes it a bit heavy to begin with but it has served me faithfully for at least 5 years and is not falling apart yet. Mask and a mask backup (especially important if, like me, you use prescription lenses in your mask). I have been using the Mares Demon masks with the press-in lenses for 10 years now. The prescription is not exact but it doesn’t need to be. Snorkel. No longer just a simple breathing tube, snorkels have got pretty high tech these days. Regulator with first stage and second stage. I currently use and like the now discontinued Aqualung Titan and previous to that I had a ScubaPro MK25. Both have been reliable. BCD. I really like my Aqualung Axiom i3 BCD with the side inflator lever rather than the standard shoulder hose. I find it more streamlined. The backplate is super comfy too and weights are integrated. Weight pouches. You might want to bring spares in case a handle snaps off or similar – but you can of course just revert to wearing a weight belt. Fins. The classic Mares Avanti Quattro are still my fave. I upgraded to steel fin straps to make it even easier get on and off. Wetsuit (3 mm or 5 mm depending on where you’re going). I like the Mares Flexa with the zip up the front. Much easier to get on and off. There are plenty of other front zip wetsuits available. Gloves (if needed). Some dive areas, like Tubbathaha in the Philippines, ban gloves completely. This is irritating if you’re a careful diver and you feel the cold! I use Mares gloves but I find they wear out on the finger tip from pulling the trigger on my camera. A dive hood (if needed). If you are susceptible to the cold, a hood is a huge help. A rash guard as extra layer of insulation – also good as sun protection while gearing up and helps get the wetsuit on and off too. Surface Marker Buoy (check this inflates properly!). I’d get something good quality and larger sized – you want to have the best chance of being seen, rather than just having the minimum requirement. Dive Computer. Suunto is what I’ve always used – I currently have a Suunto D6 titanium which I find a bit heavy on the wrist to be honest. I also keep a cheaper Suunto Zoop dive computer as backup as I’ve had the battery fail on my primary computer a couple of times mid trip. There are hundreds of different camera setups out there so it’s hard to provide a exact or exhaustive list of what to remember. I’d say that the golden rule is: make sure you fully assemble your camera as if you were about to take it into the water a couple of weeks before you get on the plane. As with your scuba gear, assembling everything in a dress rehearsal will help you spot anything missing or that has stopped working. I would also suggest carrying backups of the most vulnerable stuff – in my case, it’s the connector cable between housing and strobes which has failed on me a couple of times, so I always travel with a spare. Make sure you’ve got a universal power adapter with power surge protector. If you’re bringing lots of camera gear, computer, phone, tablet etc etc, an electrical strip with surge protection built in will be helpful. Most liveaboards will have surge protection as standard, but it’s useful to be self-reliant – plus you need to make sure your plugs fit their sockets, which an adapter will solve. Finally, when packing, remember that if it has an o-ring, like a strobe or a compact camera case, don’t travel with it sealed ie don’t close the camera case or fully assemble the strobe. If you do that, you’ll create a vacuum inside the housing or strobe, which may then explode under pressure when you’re on the plane. Protip – when you assemble the camera on the boat, remember to actually put the oring in the expensive camera housing that you have carried for thousands of miles so that it doesn’t flood on the first dive. Not that I’ve ever done that, you understand. No sir. You might want to consider diving camera insurance. I used to take it out each year, but my rig is now so old I’ve become fatalistic (and also, it’s lasted me this long and I’ve got so much experience using it, it would take doing something spectacularly stupid to flood it I think. Watch this space). The joy of a liveaboard is that you can pack very light on clothes – you’re either going to be underwater, asleep or eating – with possibly some lounging around on deck drinking sundowners. Comfortable skirts, shorts for sitting around on the boat apres-dive. Linen or cotton are good choices. Breathable walking shoes – if you’re heading anywhere tropical, getting shoes that breathe affords you some foot protection but keeps you cool too. Usually shoes are not worn on boats. Similarly, remember headphones to listen to music or audiobooks from your phone or tablet. Noise cancelling headphones can be a real lifesaver on long haul flights. With all your electronic devices, remember to bring the respective charger for each one, and also remember to check whatever you want to read/watch/listen to is actually loaded on the device and not in the cloud – otherwise you probably won’t be able to access it. Snacks like protein bars e.g. Quest, Oh Yeah! etc can be useful as a meal on the go while in transit and also as a hunger buster on the boat if you’re craving something sweet. Remember to keep any snack items wrapped up in case they go gooey – you don’t want your favourite tshirt covered in gloop due to a meltdown. Duty Free Alcohol – some countries like Indonesia have crazy prices for alcohol so bring in spirits or wine duty free if you like a tipple. NB if you’re going to the Maldives, don’t bother doing this: Customs will confiscate it on arrival. I’ve been told that vodka has on occasion passed through security in a clear plastic water bottle, but I couldn’t possibly comment.